Because I run my own mail server, I’m able to watch for trends related to incoming email and crunch numbers on those that seem interesting. Today, listening to the voice which has been telling me for the past few weeks that spam feels to be on a major uptrend, I looked at the numbers of spam messages that have hit my own inbox. (Well, make that “tried to hit my own inbox,” since I’m also able to run a general spam filter whcih catches most of the unsolicited crap.) And that voice appears to be correct; over the past two months, I’ve received way more than double the number of spam emails than in any of the months in the first half of 2007. 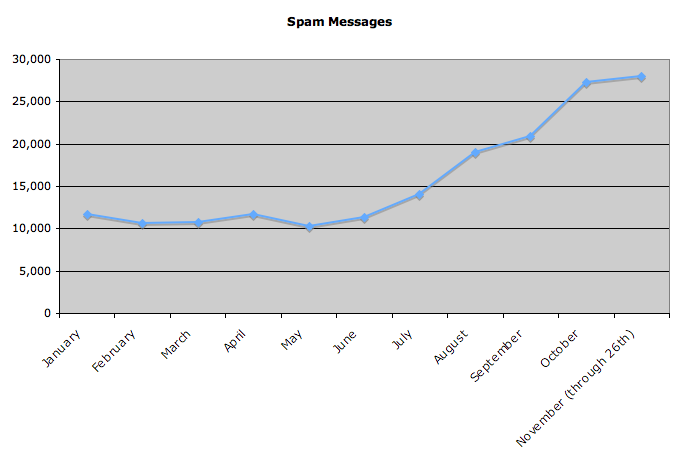 For example, I’ve received over 28,000 spams through today in November, compared to just under 12,000 in January. As always, stats can lie as much as they can reveal truth; I don’t know what my 2006 chart would have looked like, whether there’s always an uptick towards the later months of a calendar year, or any other such comparison information. Nonetheless, I figured this was interesting enough to share. Our company is “partnered” with Postini to provide antispam services to our clients, and they’ve put out some interesting material lately about the notable rise in junk email over the last couple of years. I don’t have the charts handy so I can’t corroborate the perceived trend toward a year-end rise, however.